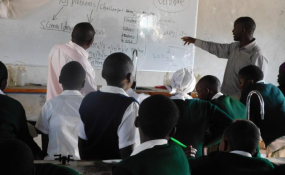 Maths and physical science teacher Peter Tabichi (far right) in class. The Keriko Mixed Day Secondary School teacher has been nominated for the one million dollar Global Teacher Prize. Bulawayo, Zimbabwe — Keriko Mixed Day Secondary School in Nakuru County, situated in a remote, semi-arid part of Kenya's Rift Valley, could pass for an ordinary secondary school in any part of Africa. But ordinary it is not. Maths and physical science teacher Peter Tabichi's love for science is changing the lives of Keriko's 480 students for the better. In a region frequently blighted by drought and famine, Tabichi's students come from poor families-almost a third are orphans or have only one parent-with many going without food at home. The students have mixed experiences from drug abuse, teenage pregnancies, early school dropout, young marriages and there have been cases of suicide. But it is his dedication and passionate belief in his students' talent, that has embolden the poorly-resourced learners to take on Kenya's best schools in national science competitions. Through his mentorship, Tabichi's students participated in the 2018 Kenya Science and Engineering Fair where they displayed an invention that allows blind and deaf people to measure objects. Using the school's only computer, and despite the poor internet connection and a student-teacher ratio of 58:1, Tabichi has impacted his student's impoverished lives. He started a Talent Nurturing Club and expanded the school's Science Club, helping pupils design research projects that are of such a high standard that 60 percent of them now qualify for national competitions. "My four colleagues and I also give low-achieving pupils one-to-one tuition in Maths and Science outside class and on the weekends, where I visit students' homes and meet their families to identify the challenges they face," Tabichi told. "I use ICT in 80 percent of my lessons to engage students, visit internet cafes and cache online content to be used offline in class." In February 2019, Tabichi was named one of the top 10 finalists for the Varkey Foundation's Global Teacher Prize 2019. The one million dollar award recognises an exceptional teacher who has made an outstanding contribution to the profession and highlights the important role of teachers. Tabichi and nine other finalists were selected from over 10,000 nominations and applications from 179 countries around the world. "I did not anticipate it," Tabichi, told IPS. "But I feel that I deserve it since I have transformed the lives of many students. Also, the nomination makes me view all the hard-working teachers throughout the world as superheroes that the world needs to give recognition for bringing a positive change to society." Raised in a family of teachers, Tabichi said he recognises the great contribution teachers bring to their communities through their dedication and passion. He added that he was inspired by his father to perceive a teacher's role as that of enlightening others on how to tackle the challenges of life. "The main focus will be on the community and school. For example, I would strengthen the Talent Nurturing Club, the Science Club and inter-school science project competitions," said Tabichi. He added, "I would also invest in a school computer lab with better internet connectivity. In the community, I would promote kitchen gardening and production of drought tolerant crops." Congratulating Tabichi for his nomination, Founder of the Varkey Foundation and the Global Teacher Prize, Sunny Varkey hoped Tabichi's story would inspire those looking to enter the teaching profession. "The thousands of nominations and applications we received from every corner of the planet is testimony to the achievements of teachers and the enormous impact they have on all of our lives."